DYNAMIC Yorkshire athletes who last year ran, kayaked and cycled across Europe in aid of our Armed Forces heroes, are counting down the days to the their next marathon challenge. The Ultra 6 Great Britain challenge, spearheaded once more by Leeds’s Andy North and colleagues, will see a team of six runners complete a daily cycle and marathon from July 14th- 20th to raise money for ABF The Soldiers’ Charity and the Forces’ Children’s’ Trust. And the marathon effort has received a massive boost thanks to the endorsement of two Olympic gold medal winning cyclists, among other key supporters. The team has won crucial backing from triple Olympic gold medallist Jason Kenny OBE. Jason is endorsing the Ultra 6 Great Britain challenge through use of his signature of specially created Ultra 6 hydration bottles, which the team will use on their marathon effort, and which are on sale now. At just £6, every bottle sold will contribute over £3 to ABF The Soldiers’ Charity and The Forces’ Children’s Fund. Meanwhile Ed has lent his support to the effort through his connection with 9Bar Nutritional bars, a major supporter of the Ultra 6 effort. The team has also received another major boost thanks to Tony Booth, of All Terrain Cycles, at Saltaire, Bradford, who is providing the high endurance cycles for the multi-day event. Andy North, Ben Wood and team aim to complete the 850 mile trek from Land’s End to John O’Groats in a world record time of just 6.4 days; in that time they will complete 26.2 miles daily and then cycle a further 100 miles on the same day; a total of 15 hours on the move each day. “Since we announced our new attempt a few months ago, we have been overwhelmed by the support we have received from members of the public, businesses and key supporters either directly or in kind. “What better endorsement can we receive than the backing of two Olympic gold medallists who are not only the best of British but who are among the greatest ambassadors for cycling and their specialist fields. “We also must say special thanks to Tony Booth , of All Terrain Cycles from Saltaire,who has given us a tremendous boost by supplying the amazing cycles we will be using on this effort. “We have also been extremely grateful to 9Bar healthy nutritional bars who are also making many things possible through their key support. “We must make special mention of Cpl Andy Reid who is facing an extraordinary difficult challenge in attempting his first consecutive distance bike ride since his horrific injury fighting for our country. Big hearted businesses and members of the public who sponsor the event are invited to join in the endeavour. Each entrant will be able to drop in and out at any stage and will be helping the Ultra 6 team to break the world record. 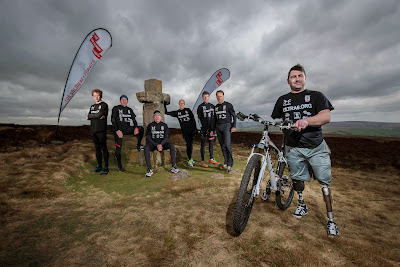 The six man Ultra6 entourage will be joined for four days along the route by former soldier Andy Reid who lost three limbs whilst serving in Afghanistan with 3 YORKS in 2009. As a result of the IED explosion, Andy lost his right leg below the knee, left leg above the knee, and right arm. After being flown back to the UK, he astounded people with his recovery by only spending only two weeks in hospital. The Soldiers’ Charity, the national charity of the British Army, was instrumental in supporting Andy during his recovery by providing a number of grants to aid his rehabilitation and make adaptations to his home. The team also hope to inspire young people so in the run up to the event, are rolling out a programme to schools and other institutions aimed promoting well-being, health and fitness in young people. Inspired Life.org, in tandem with the Ultra 6 team, will be trail-blazing the efforts of the Ultra 6 teams to encourage youngsters to get out of the house and to get fit. This is not the first time the Yorkshire adventurer has gone to the extreme in support of charity; in autumn 2011 Andy North completed the Sunshine Challenge. He undertook the equivalent of 25 marathons, covered over 1,750 miles of cycling and kayaked 36 miles, down the river Themes and over the English Channel, over 43 days of physical endurance from Catterick Garrison to Gibraltar. This year the Andy will also be joined by Ben Wood who brings his vast cycling skill & knowledge from his many years working at All Terrain Cycles in Bradford. “We will be staging a major launch party for the event on June 29 which will be attended by Cpl Andy Reid and Sharon Gater who is the UK no.1 endurance champion among other top guests. “Sharon is one of the best female ultra-runners in the world and she holds several records such as the seven day record over 750 km, which she established in March 2011 at the seven day race of the Athens Ultramarathon Festival. “Her support is yet again a great example of how many notable people from the world of sport and beyond are supporting us for this very worthwhile cause. “We will be announcing more news in the run up to the start day and anyone who wishes to support us in any way can do so by visiting our website. •​Should the team set a world record those who have taken part in the event will be recognised by a certificate presented by the key sponsors & the team. The Ultra 6 team comprises Andy North, from Guiseley, Ben Wood, from Keighley, Mike Senior from Harrogate, Mick Bowden, from Boston Spa, Dave Edwards from Calverley and Martin Mansell from Heckmondwike. NB While Jason and Ed will not be cycling in the event in July, they are lending their support indirectly through endorsements. Having won numerous World and European titles as a junior, Jason took a massive leap in 2008 when he was selected for the Olympics squad and found himself on the plane to Beijing. After putting in some strong times during training, he was selected for the Team Sprint, alongside seasoned Sprint riders Jamie Staff and Chris Hoy, giving Jason his first taste of Olympic victory at just 20 years of age. Emerging from the shadow of Sir Chris Hoy, who claimed Gold to Jason’s Silver in the Individual Sprint in Beijing, Jason was chosen ahead of Sir Chris for the same event for the London 2012 Games – and proved the decision correct by winning Gold, defeating his great rival, Frenchman Gregory Bauge. Jason also retained his Olympic title in 2012 in the Team Sprint alongside Sir Chris and Philip Hindes, catapulting him to national fame and recognition. Born and bred in Bolton, Jason has had the leisure centre at the Bolton One complex named after him and is justifiably proud of that fact. Jason was back in the saddle within a month of finishing racing at the London Olympics, and his preparation and determination immediately paid off – he won Keirin Gold in the World Championships in Minsk in February 2013. A two-time Olympic Gold medallist, an Olympic Bronze medallist and five-time world champion - Ed is a fundamental member of the awe inspiring Great British cycling team. On the track he competes in the team pursuit and as an individual in the new Olympic discipline called the Omnium - a multi race event. Ed is a World, Olympic and European Champion on the track and also rides for the domestic road team Rapha Condor JLT. Regarded as an explosive sprinter with the durability to match, he took Gold in the team pursuit and Bronze in the individual Omnium at London 2012.